Product prices and availability are accurate as of 2019-04-25 14:27:16 UTC and are subject to change. Any price and availability information displayed on http://www.amazon.co.uk/ at the time of purchase will apply to the purchase of this product. 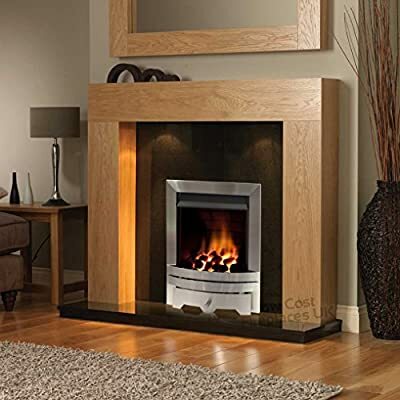 Oak Mantel with Fitted Downlights, Black Granite Hearth & Back Panel, Brushed Stainless Steel Gas Fire **UK Mainland Only (we do not deliver to IV, KW or TR postcodes)** **When ordering please send us a current phone number** Suitable for: Class 1, Class 2 and Pre Cast Flues. Chimney required. See full description (below) Low Cost Fireplaces is a trusted online retailer with over 10 years internet experience. Most of our fireplaces are made to order in the UK by skilled craftsmen who use high quality materials. Our business has gone from strength to strength in recent years due to our ongoing commitment to high quality products at low prices.